Hydrogen Generation Market size was above USD 110 billion in 2015 with forecast to grow over 5% from 2016 to 2024. Growing demand for diesel fuel from both international and domestic application coupled with growing economics will drive the global hydrogen generation market size. Hydrogen is primarily used to reduce sulfur content of diesel fuel. Stringent regulation to reduce sulfur content with growing concern related to carbon emission will favor the business growth from 2016 to 2024. In the U.S., federal and state government has implemented programs to limit the amount of sulfur content in diesel fuel, gasoline, and motor oil. Concern authorities are planning to implement tier 3 program which aim to reduce sulfur content in gasoline by 10ppm. Increasing crude oil consumption in developing countries such as India and China will stimulate the industry growth in future. In April 2016, the crude oil consumption was at 48.5 million tons which is 7.8% higher as compared to 2015. Rising investment by refiners towards upgradation and expansion of refineries to meet sulfur and emission regulation will positively encourage the hydrogen generation market size in coming years. H2 is used in various hydrotreating process of refinery such as, hydrodesulphurization and hydrocracking for extensively processing of residue. Increasing consumption of 'heavy crude oil, may further complement the industry outlook. Positive outlook towards metals, glass industry, semiconductor, propellant fuel, and chemical will further stimulate the business growth. Transportation and distribution challenges associated with H2 and high cost of hydrogen as compared to fossil fuels may act as restrain for hydrogen generation market growth in near terms. Captive hydrogen generation market size is expected to exceed 150 billion in 2024 and is expected to witness a significant growth during forecast period subject to its wide application in refinery to crack the heavier crudes and in metal industry to yield iron reduction. The growing demand for hydrogen in refineries will positively influence the demand for merchant hydrocarbon in future. Steam reformer hydrogen generation market share is expected to witness a significant growth from 2016 to 2024 subject to easy availability and low prices of natural gas. This process is used to produce H2 from natural gas or methane. The process involves, methane reaction steam under 3 to 25 bar pressure in presence of a catalyst to produce carbon monoxide, H2, and few amounts of CO2. Global hydrogen generation market share from electrolysis process was over 7% of global revenue share in 2015 and is predicted to witness growth over 5% from 2016 to 2024.It is used to generate hydrocarbon from water through the application of electric current. Petroleum refinery hydrogen generation market size was valued over USD 40 billion in 2015 and is expected to witness significant growth during forecast period subject to its wide application in hydrocracking process coupled with rising demand for middle distillates such as gasoline, diesel and others. Chemical applications contributed over 50% of global hydrogen generation market share in 2015 and is expected to exceed USD 90 billion by 2024 owing to increasing demand for ammonia from fertilizer industry. The ammonia is widely used for urea production. Rising crop price has been positively influence the growth of fertilizer industry. Rising demand for steel from construction and automobile industry with increasing purchasing power will stimulate the hydrogen generation market growth from 2016 to 2024.Other segments including glass, semiconductor and propellant fuel industry is expected to exceed USD 5 billion by 2024. Asia Pacific is expected to witness a growth over 5% owing to increasing demand for petroleum products from refineries coupled with emerging economics. India hydrogen generation market size was valued over USD 5 billion in 2015 and is expected to grow over 5% from 2016 to 2024. To meet the transportation fuels demand, India is investing additional USD 30 Billion in refining projects through 2020. China is expected to cross over 5% by 2024 owing to growing demand for ammonia. U.S. hydrogen generation market size was valued above USD 15 billion in 2015 and is expected to witness a substantial growth from 2016 to 2024 owing to stringent motor vehicle emission regulation. Escalating demand for ammonia used as feedstock for urea will positively influence industry outlook. Saudi Arabia hydrogen generation market share was exceeded USD 3 billion in 2015 and is expected to witness growth over 5% by 2024 subject to increasing demand for fertilizer. Venezuela hydrogen generation market share contributed over 25% of regional revenue share in 2015 and is expected to witness growth over 5%. Refinery expansion and remodeling of existing installation is expected to propel industry growth. 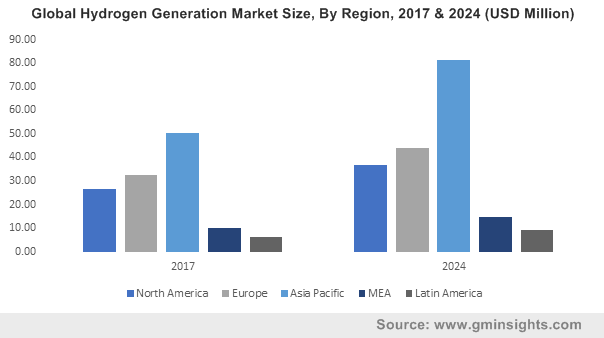 Europe hydrogen generation market share is expected to witness growth owing to increase in demand for chemicals from construction and food & beverages industry. Germany contributed over 15% of regional revenue in 2015 and is expected to exceed USD 5 billion by 2024. Global hydrogen generation market participants include Showa Denko K.K., Messer Group GmbH, Caloric Anlagenbau GmbH, Nuvera Fuel Cells, LLC, Xebec Adsorption Inc, Taiyo Nippon Sanso Corporation, Hydrogenics, Praxair Technology, Inc, Iwatani Corporation and others. Hydrogen is used to remove containment including sulfur and process crude oil into refined fuels such as, diesel, gasoline. It can be produced using various process. Steam reformer and electrolysis is used to generate H2. Increasing crude oil consumption coupled with stringent regulation to improve fuel quality will drive the industry growth during the forecast period. Increasing demand for desulfurization, upgradation of conventional petroleum, and for production of ammonia may also complement the industry outlook from 2016 to 2024.